As you know, Bitrix24 is the cheapest telemarketing and unified communications software in the world (it’s hard to beat free software that charges you only for outgoing calls, phone number rental or connector to your own PBX). When we added ability to make phone calls from browsers over a year ago, one of the reasons was to give you a way to forego a necessity of buying VoIP phone sets, which tend to be quite pricey, typically $100-$300 per set. But old habits die hard, and many of you seasonal sales professionals seem to attached to those physical phone sets sitting on your desks. 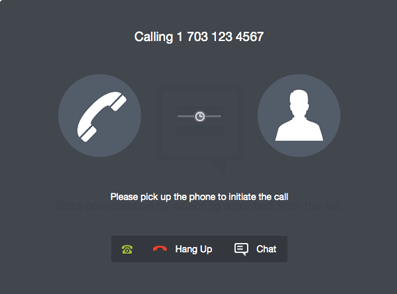 Due to popular requests we’ve added SIP phone support and you can now use them when making and receiving calls to/from Bitrix24. To make it clear, you will still have access to all Bitrix24 telephony and CRM features when you use SIP phones. You’ll see your client or prospect information on your computer screen when talking to them, all calls will be logged, recorded (if you’ve enabled the option) and attached to CRM records, you’ll be able to transfer phone calls and use internal extensions. 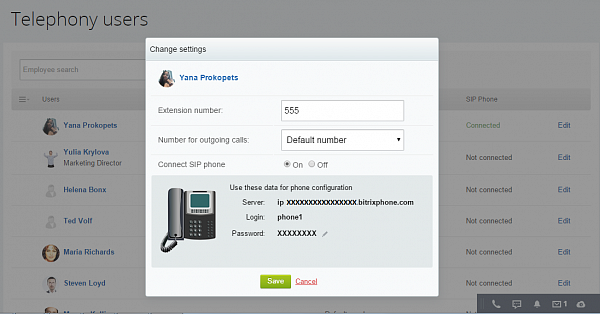 You’ll see that our telephony menu has changed a bit and now include ‘SIP Phones’ and ‘Telephony Users’ items that let you connect SIP phones and configure individual extensions. We do have additional telephony and CRM features scheduled to be released in April and May, so stay tuned!